and we jumped in the car for a Starbucks run. Then I turned my frog-inspired sketch into the top of the Puddle Jumper quilt. I've used a couple of the prints from Tula Pink's Prince Charming collection and added some text from Tidings and Tales (J. Wecker-Frisch, Wilmington Prints) and Joel Dewberry's Herringbone from his Modern Meadow collection. The solids are from my stash, most likely from Joann's. All in all, a beautiful day! Awesome! Love seeing your sketch next to the finished top. I LOVE this quilt top! Oh , Donna -- I like your frog!! The quilt is just adorable. 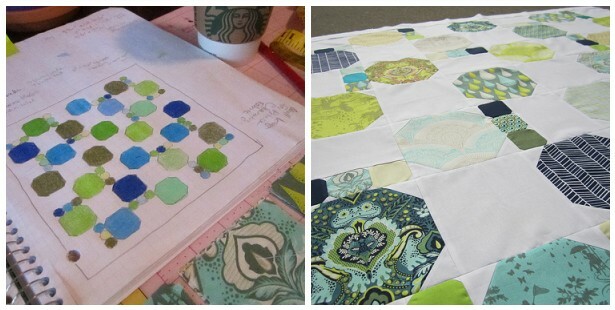 Your quilt is perfect for showing off such beautiful fabrics! Your dogs are so cute!! I like the way they look as though they're doing the driving!